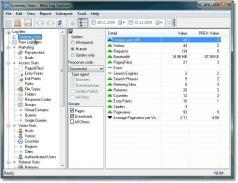 Web Log Explorer Professional is a full-featured tool you can use to generate reports and graphs related to file access and activity statistics, but also for data related to search engines, referring sites, referring pages, errors, and visitor countries. The built-in wizard makes it very easy to generate reports, as it will take you through the setup, plus you can create a new, blank workspace file or load an existing project. You’ll be able to select the local path for the log file, FTP, ODBC or HTTP. The program allows you to use one or multiple servers, fill in information about the index file and URL, display internal referrers, add country to IP and other useful options. To track your visitors’ sessions you can activate various related options such as cookie, IP address and user agent as well as URL. On top of that, Web Log Explorer Professional allows you to customize the date format, time zone, first day of the week and adjust the session timeout settings. A handy QlikView data file viewer you can use on the go. Compares and synchronizes database schemas and contents.